Africa is getting a lot of attention for its promising future, and it’s largely well deserved. The continent has six of the ten fastest growing economies in the world (The Economist, 2011) and the folks at McKinsey predict that it will have the world’s largest middle class by 2020 (Ottela & Russo, 2011). Despite the astounding growth, there is still a big gap between the high-growth nations in Africa and other developed global economies. Moreover, there is a big gap between Africa’s largest economy, South Africa, and the second and third largest, Egypt and Nigeria, respectively. The chart below visualizes the gaps that exist amongst Africa’s Big Three. Added mobile penetration in Egypt and Nigeria, the second and third largest African economies respectively, will boost economic growth enough to narrow the gap among the top three, including the largest African economy, South Africa. How did we come up with this hypothesis? It’s proven that increased mobile penetration, specifically an extra 10 phones per 100 people, boosts GDP growth by 0.8 percentage point (The Economist, 2009; World Bank). We knew that additional mobile phones would have a positive effect on Nigeria’s GDP, and wondered if it would be enough to increase its economic ranking. 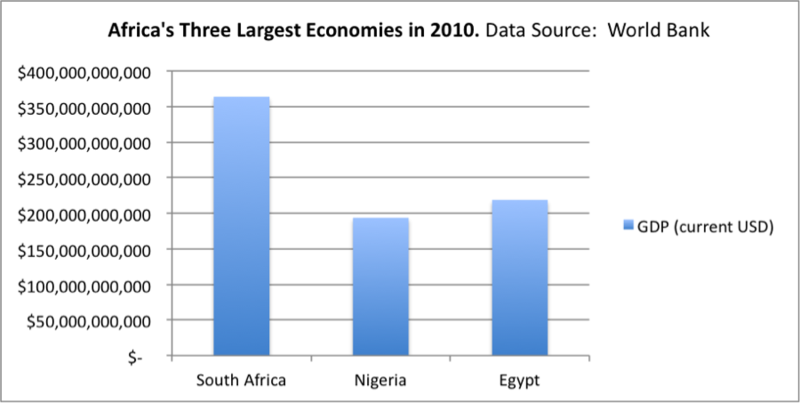 While South Africa’s economy is larger in terms of GDP, Egypt and Nigeria have much larger populations. South Africa has already reached 100% mobile penetration and Egypt is close. However, Nigeria, with a larger population than the other two combined, still has half of its population waiting to own a mobile phone. This means that a large volume of mobile phones will be added to the Nigerian population and a smaller yet still significant amount will be added in Egypt. The following chart demonstrates the total population of each country in blue, and the number of mobile subscriptions in red (World Bank, 2010). 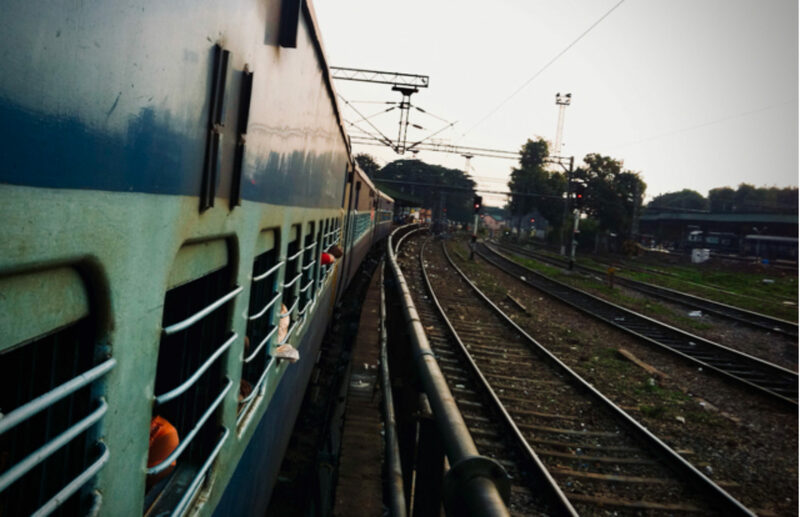 Based on anecdotal evidence, we knew that mobile phones and their accompanying services offer intangible benefits to users and informal economies. Egypt and Nigeria stand to earn significant gains from mobile telephony. Not just from the variety of applications like mobile money, mobile health, and mobile agricultural apps, but also the social and information exchanges that mobile phones facilitate. Just this year, Egyptians leveraged mobile telephony to protest, organize, and revolutionize Egyptian life. It’s not a coincidence that mobile penetration grew by over 25% in 2010 from 2009. We expect similar jumps in Nigeria’s growth and that the population will grow and change, too. To test our hypothesis, we projected mobile penetration until Egypt and Nigeria reached 100% penetration on a similar growth curve demonstrated historically in South Africa. Then, based on the added 0.8 percentage point, we projected future GDP growth with a mobile penetration multiplier. Let’s take a look at the numbers. South Africa has reached its full potential in terms of penetration, meaning that virtually all 50 million South Africans have at least one mobile phone subscription and some even have more than one. On the other hand, there are many Egyptians and Nigerians waiting to experience the benefits of a mobile phone subscription. Eighty seven percent of the 80+ million people in Egypt own a mobile phone. An additional 10 million mobile phones will bring Egypt to 100% mobile penetration. Even more impressive is the situation in Nigeria, where penetration is around 50% of a 160 million population. That means there are about 80 million Nigerians who are future mobile phone subscribers. This is staggering, as the added economic benefits that will come with those 80 million phones will have an effect on both the country and the continent. 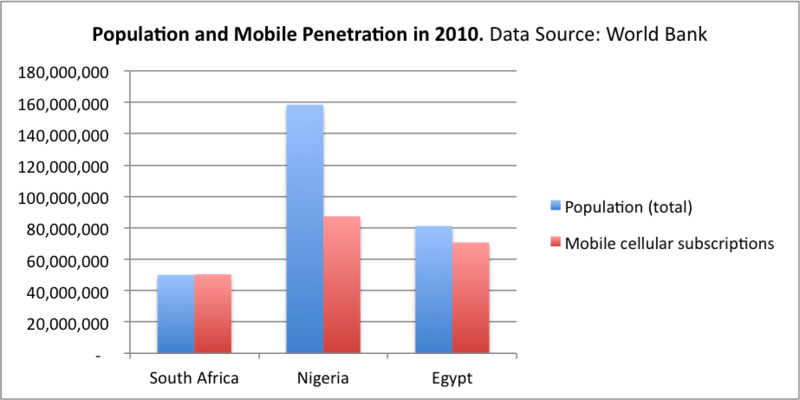 It’s easy to conclude that Egypt and Nigeria will eventually hit 100% penetration. When, however, is not quite as obvious. After large increases, South Africa demonstrated a declining growth curve after the point where mobile penetration hit 70%. Egypt experienced a significant growth spurt in 2010, and we expect that next year’s growth will not be as drastic. We expect Nigeria to demonstrate a similar growth curve in the future. Therefore, we assumed that the flex point between exponential growth and when growth begins to decline logarithmically is between 70-85% penetration. Based on these assumptions, we projected mobile penetration for the three countries using the World Bank’s historical data from 2002 through 2010. 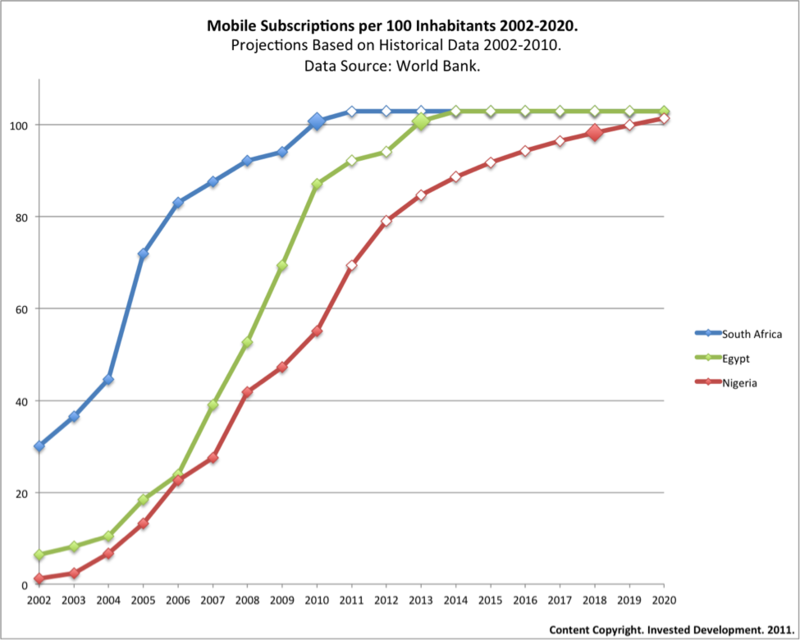 The chart below shows mobile penetration (or mobile subscriptions per 100 inhabitants) from 2002 through 2020, using the World Bank’s reported mobile penetration rates from 2002 through 2010 and our projections from 2011 (illustrated by the white marks). The oversized, solid marks in 2010, 2013, and 2018 indicate the year the country reaches 100%. South Africa passed 100% in 2010, Egypt reaches 100% penetration in 2013, and Nigeria does so in 2018, according to our predictions. Once we knew the projected number of mobile phones in each population, we calculated GDP. We did this two ways. First, we projected GDP using average growth rates from World Bank Data. Then, we added multiplier to account for the expected boost in GDP growth coming from additional mobile phones in the population. We found that the mobile penetration multiplier provides both Nigeria and Egypt with an additional $15 billion each accrued over 2011 and 2020 due to the economic boost from mobile phones. This growth alone is significant for each country, regardless of whether it changes their relative economic rankings. Finally, we compared the boosted GDP of the three countries. 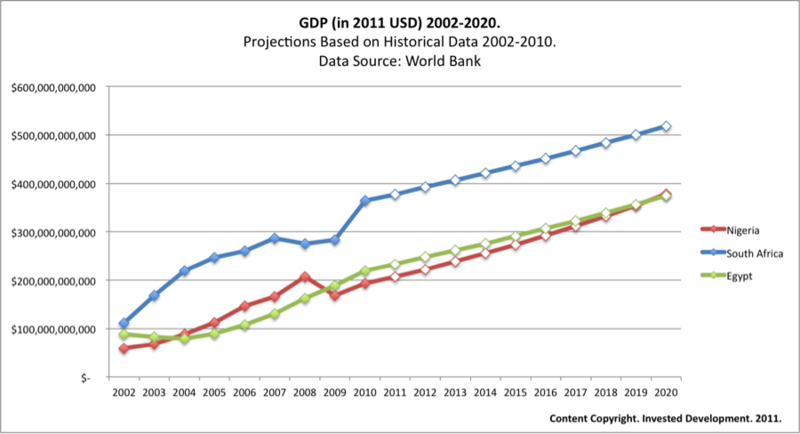 The following chart shows historical and projected future GDP in current USD (Data Source: World Bank) with the added GDP growth multiplier. We based future GDP on the assumption that growth would follow the linear path demonstrated through 2010. Again, the points from 2011 on are our projections, highlighted with the white marks. Neither Nigeria nor Egypt outpaces South Africa in the near future. However, Nigeria is on track to outgrow Egypt within the next ten years. Of course, historical data tells us that GDP is not going to increase as smoothly as we have projected and we are not attempting to project likely GDP in any given year. What we are illustrating is the impact that mobile phone subscriptions can have on the overall economic growth. We assume that GDP increases each year will show a linear correlation along the projected path. . Although the results don’t show a dramatic shift in ranking, the gap closes and it’s likely that Nigeria will outgrow Egypt based on these basic calculations. This is evidence that there will be many other similar, and possibly unexpected shifts throughout the rest of the increasingly mobilized African nations. Unfortunately, GDP does not capture the intangible benefits of mobile ubiquity. We’re certain that the impact of the volume of additional mobile phones will influence the small business sector and the country’s informal economies. Keep an eye on the blog for our next post; we’ll discuss other factors that contribute to economic growth and highlight why Africa’s largest economies could be trading places.